The global biomethane market is on a growth trajectory mainly due to the green gas characteristic of biomethane. Biomethane is produced by the natural breakdown of organic matter, which includes agricultural waste, green waste, household waste, food industry waste, and even industrial waste. The process involves disintegration of organic material in an anaerobic environment to produce biogas, which is further purified to produce biomethane. A significant factor fuelling growth of the biomethane market is the high potential usage of biomethane in the automotive and power generation sector. The developed countries of the world are increasingly diversifying conventional energy production practices to include renewable sources for energy needs. The recently concluded Climate Change Conference in Paris has led many countries to include more of renewables and cleaner fuels for energy production. In particular, the European countries have set targets to increase the share of renewable energy to 20% by 2020 and to increase it to 80% by 20250 in the energy mix. A report by Transparency Market Research forecasts the global biomethane market to reach a valuation of US$2,624.5 mn by 2025 increasing from US$1,485.4 mn in 2016 at a CAGR of 6.7% between 2017 and 2025. In terms of application, the global biomethane gas has been segmented into automotive sector and power generation in this report. Of the two, the automotive sector is expected to account for significant share of the global biomethane market. As the automotive sector is responsible for significant volume of greenhouse gas emissions, the usage of biomethane as an automotive fuel will directly benefit the environment in terms of reduced emissions. The similar properties between biomethane and natural gas allows the latter to be substituted by the former. Thus, biomethane can be injected to natural gas grids and used a fuel mix in the transportation sector. 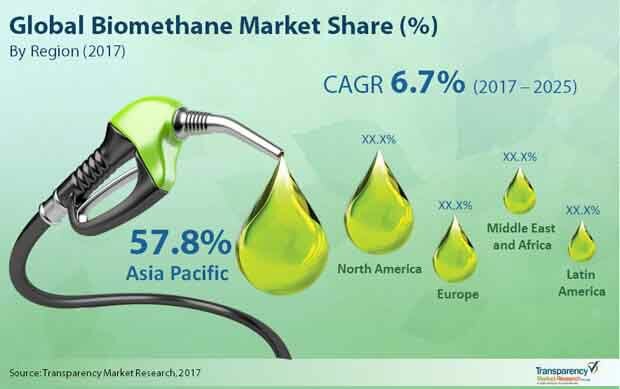 The feedstock segments of the global biomethane market are organic household waste, animal manure, energy crops, agricultural waste, sewage sludge, industrial food processing waste, and others. Of these, agricultural waste is extensively used feedstock type in the biomethane market. Animal manure also accounts as a leading feedstock type in the biomethane market. The key regional segments of the global biomethane market that are considered in this report are North America, Latin America, Europe, Asia Pacific, and the Middle East and Africa. In 2016, Europe and North America held significant share of the overall market on account of significant biomethane production and consumption. The trend is expected to continue until the end of the forecast period in 2025. In addition, in European countries, favorable laws and financial assistance programs for production of biomethane is also benefitting the growth of biomethane market in the region. Sweden, Germany, Switzerland, and France are some key domestic markets for biomethane production that have standing in the global biomethane market. These countries have higher rate of adoption of biomethane as an alternative fuel. Asia Pacific and Latin America markets for biomethane are expected to expand significantly with renewables increasingly being used in the energy mix. CNG Services Ltd., Planet Biogas Global GmbH, VERBIO, Future Biogas Ltd., Magne Gas, Gasrec, Gazasia Ltd., Biogas Products Ltd., SGN, Schmack Carbotech GmbH, EnviTec Biogas AG, SoCalGas, ETW Enerietechnik GmbH, ORBITAL, and JV Energen are some of the leading players operating in the global biomethane market. Biomethane can be produced either by anaerobic digestion or by gasification of organic matter. Organic matter fed into the biomethane plant is transformed by anaerobic process into biomethane i.e. a compound of methane (CH4) and carbon dioxide. As of 2016, Biomethane production from biogas was a single largest source, globally. Biogas is upgraded by various gas treatment processes to produce biomethane. During this upgrading process, contaminants are either absorbed or scrubbed from the gas to obtain more methane per unit volume of the residual gas. Gasification converts organic matter into syngas, which is then processed to produce methane. Methane as a whole is about 20 times more potent GHG (Greenhouse Gas) than CO2 if released in atmosphere. When used in power generation, it generates heat and emits carbon dioxide and some other gases. Despite all this shortcomings, biomethane produced from organic matter eliminates the release of a great deal of methane and other harmful gases into the atmosphere. The production of biomethane eliminates exposure of decaying organic matter to the air. This avoids methane and other harmful gases from fleeing into the atmosphere. Primary research represented the bulk of research efforts, supplemented by extensive secondary research. We reviewed key players’ product literature, annual reports, press releases, and relevant documents for competitive analysis and market understanding. This has proven to be the most reliable, effective, and successful approach for obtaining precise market data, capturing industry participants’ insights, and recognizing business opportunities. Secondary research sources which were typically referred to include but are not limited to: company websites, annual reports, financial reports, internal and external proprietary databases as well as relevant patent and regulatory database, national government documents, statistical databases, market reports, news articles, press releases, industry magazines, webcasts specific to companies operating in the market, and regulatory databases such as ICIS, Hoover’s, Factiva and Bloomberg, national government documents, statistical databases, and webcasts specific to companies operating in the biomethane market. We conduct primary interviews on an ongoing basis with industry participants and commentators to validate data and analysis. Primary and secondary research were conducted to understand and arrive at trends, which were employed to carry out forecasts for the biomethane market. These help validate and strengthen secondary research findings. These also help develop the analysis, team’s expertise and market understanding. Key major players operating in the biomethane market include CNG Services Ltd., SGN, PlanET Biogas Global GmbH, Future Biogas Ltd., VERBIO, Magne Gas, Gasrec, Gazasia Ltd., Biogas Products Ltd., Schmack Carbotech GmbH, EnviTec Biogas AG, SoCalGas, ETW Energietechnik GmbH, ORBITAL, and JV Energen.